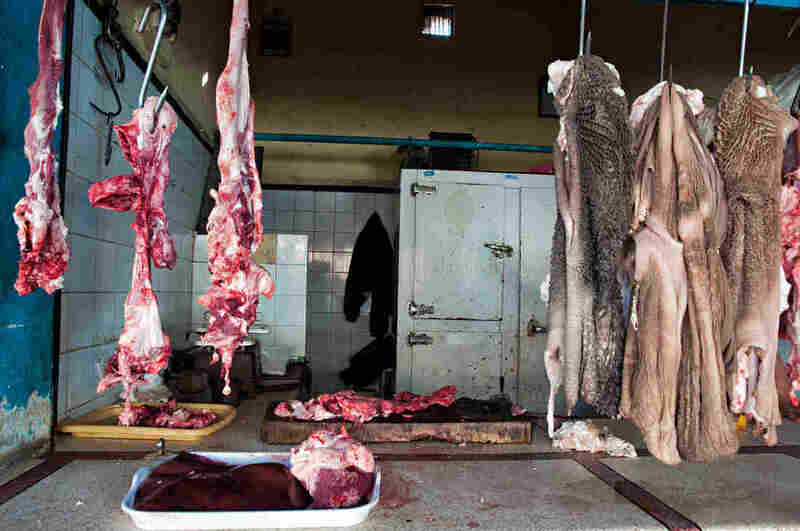 African Food Safety Report Explains High Rate Of Foodborne Illness : Goats and Soda Over 100,000 people in the continent die each year from foodborne illnesses. A new report looks at the reasons the toll is so high. Meat at a butcher's shop in a Moroccan market. Lack of refrigeration contributes to Africa's high rate of foodborne illnesses. In September, public health officials in South Africa finally declared victory over the world's worst-ever outbreak of listeriosis, a foodborne illness that had sickened more than 1,000 people and killed more than 200 there since January 2017. The cause? A batch of "polony," a popular processed lunch meat similar to bologna, contaminated with listeria, a bacteria found in animal feces. Government health inspectors traced the outbreak to a factory owned by the South African packaged foods producer Tiger Brands, and ordered the recall of nearly 6,000 tons of affected food. Even with that particular crisis under control, Africa as a continent continues to suffer from the world's highest per-capita rate of foodborne illnesses. A new report this month from the World Bank's Global Food Safety Partnership points to one reason why: Much of the funding for food safety efforts on the continent come from Western donors — and most of those efforts concentrate on safety standards for foods exported to other countries. "Trade is important for a lot of [African] economies," says Lystra Antoine, the CEO of the Global Food Safety Partnership and one of the report's authors. But, she says, "that has an unintended consequence." There hasn't been as much investment in safe food for the domestic consumer, she adds. "There needs to be much more attention on foodborne illness. The burden is unacceptably high." According to the World Health Organization, foodborne hazards are responsible for 137,000 deaths and 91 million acute illnesses in Africa every year — mostly affecting children under the age of 5. The risks include dangerous strains of bacteria like salmonella and E. coli, as well as tapeworm and other parasites, and naturally occuring toxins like cyanide. Public health experts are worried that little is being done to address the problem. "The numbers are pretty staggering," says Ashish Jha, director of the Harvard Global Health Institute, who was not involved in the report. "It's a major public health problem, right below tuberculosis, malaria and HIV. But foodborne illness has flown under the radar screen." The report, which was partially sponsored by Walmart, Cargill and Mars, Inc., analyzed more than 500 donor-sponsored food safety initiatives, from one-day food handling seminars to decade-long scientific research projects like the Partnership for Aflatoxin Control. Together these initiatives represent nearly $400 million in spending since 2010 by more than two dozen national and multilateral development agencies, including the U.S. Agency for International Development and the European Commission's International Cooperation and Development Directorate. The report found that more than half of those projects are "overwhelmingly focused on supporting overseas market access" — that is, making sure raw products like Nigerian tomatoes, Ugandan coffee and Ghanaian cocoa are up to the standards of regulators like the U.S. Food and Drug Administration. It's an understandable emphasis — food exports from Africa have more than doubled between 1998 to 2013, to nearly $64 billion, according to the International Food Policy Research Institute. But safety hazards that arise as food products move from smallholder farms to local, informal markets don't get the same attention, even though that's how most Africans get most of their food, the report says. The report also found an imbalance in which food hazards get the most attention. Aflatoxin, which is produced by a fungi that can grow on improperly dried peanuts and cereals, received one-third of that $440 million in funding — in part because it was priority for the Bill and Melinda Gates Foundation (a funder of this blog). Meanwhile, salmonella, which WHO estimates is the top cause of food-related deaths in Africa, received less than five percent of the total funding. Erastus Kang'ethe, an emeritus professor of public health and food safety at the University of Nairobi, says many African governments lack the resources to effectively regulate food safety risks and have relied on international organizations for training and policy guidance. That approach naturally shifts the conversation toward how African food producers can meet foreign safety standards rather than developing and enforcing their own. African governments have historically focused on quantity over quality, Kang'ethe says, aiming to accelerate food production to avert hunger in a rapidly growing population, often without developing the infrastructure needed to keep food safe. "Governments didn't put much importance on safety," he says. "The question was, can our people be fed?" At the same time, he says, both producers and consumers often lack awareness of food safety risks and may not have access to refrigeration for meat and dairy products during transportation from farm to market or at home after purchase. People who suffer from a food-related infection or parasite may not make the connection to improperly stored or contaminated food, Kang'ethe says, and clinics often lack the knowledge or resources to diagnose foodborne illnesses, meaning that the true burden is likely far higher than what WHO has reported. Progress is being made, he says. Over the last few years, the African Union has been organizing the first continent-wide food safety authority, which is set to deliver a report by next year on strategies to improve oversight of food safety on farms, in factories and at markets. In response to the report, a USAID spokesperson said in an email to NPR that the agency "has been adjusting its food safety investments to target both trade and local food markets in recent years." As Africa's food system becomes industrialized, the risk of foodborne illness for domestic consumers has increased, the report found. Diets across the continent are diversifying, and meals that once centered on staple grains are now more likely to include meat, vegetables and dairy products that can be vectors for disease. Foods are traveling longer distances before reaching consumers, offering more opportunities for a break in the cold storage chain or other potential sources of contamination. And as the South Africa example disturbingly illustrated, when something goes awry at a processing plant, a large number of people can be put at risk. "One of the things the South Africa listeria outbreak did was to really shine a light on how important food safety is," Antoine says. "We were watching people die as a result of this." "If you're not ensuring the food coming out is safe, now you can infect hundreds or thousands of people more efficiently," Jha says. "The imperative to have a better regulatory system really goes up as you get more development." One solution, Kang'ethe says, is for African governments and development agencies to tap the expertise that has accumulated around export markets to improve safety for domestic consumers — for example, having farmers, plant managers or market vendors with good safety records train their less-experienced peers. Improving food safety isn't just important for reducing the risk of illness: It's also essential in confronting the broader issue of hunger. Africa remains the continent with the world's highest rate of undernourishment, according to the U.N., affecting one in every five people, 256 million in total. "We're not likely to achieve everything we talk about with food security if the food you have is not safe," Antoine says.